As soon as we have booked the church and reception for Rafael's baptism, the next thing I started scouting for on the internet was the souvenir for the godparents. Looking for a baptism souvenir was a tough task. I was searching for something personalized, cute, useful, and of course, affordable. Theme cupcakes were actually cute, sweet, and sensible. 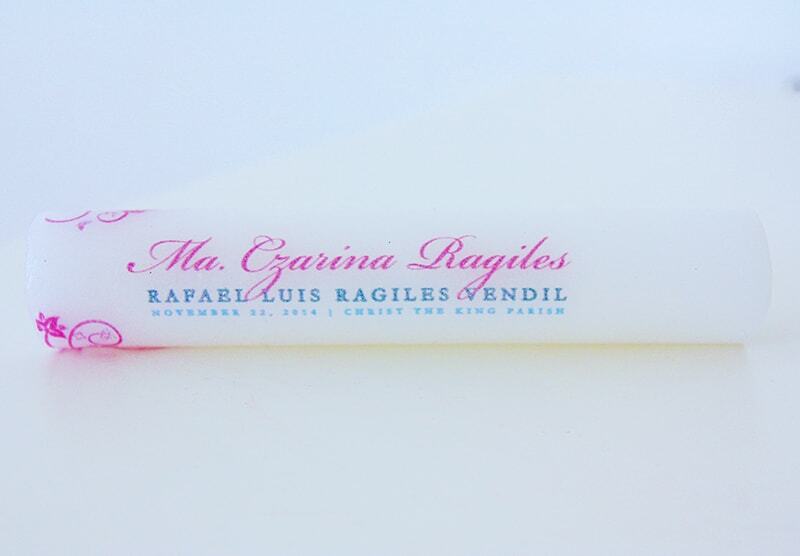 However, as much as possible, I wanted Rafael's souvenir to be something non-consumable. I wanted something that can be easily seen but not plainly decorative in purpose which would only harbor dust as years pass by. I wanted something functional, something practical. I was thinking maybe wind chimes, picture frame, mug, etc. but I was not convinced. I was already about to lose hope and give-in to the cupcake trend when I chanced upon Clay Land Souvenir Shop's website. I saw several of their personalized souvenirs which I found really cute. 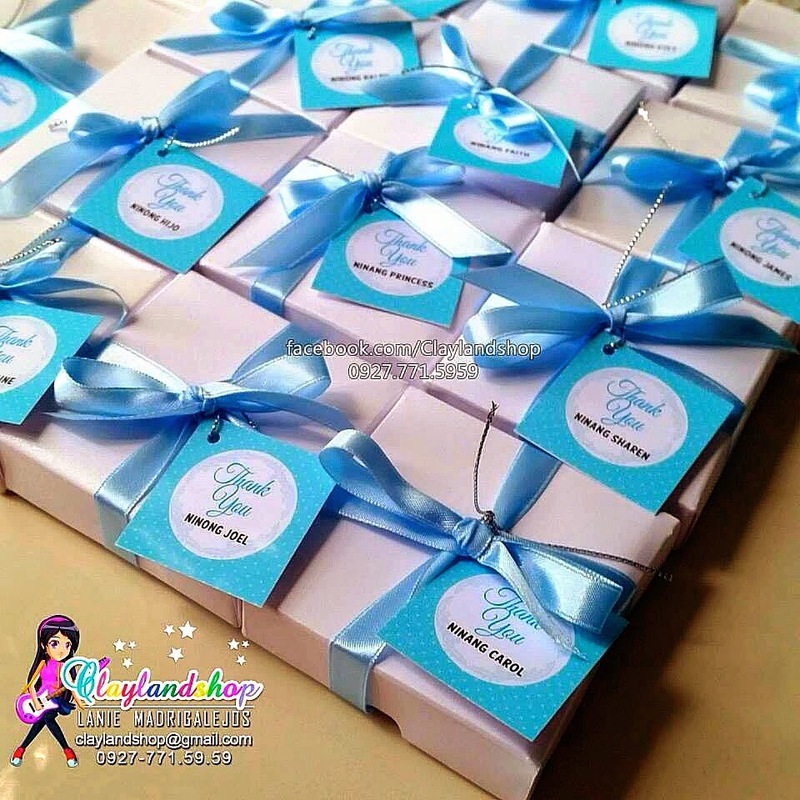 Clay Land is actually an online shop selling made-to-order give aways (for baptism, birthdays, weddings, etc.) and invitations. Among the different souvenir items that they offer, I liked the ref magnet more. It's cute, colorful, useful and most importantly, personalized. I love personalized gifts. For me, a simple gift becomes more valuable whenever it bears your name or initials. 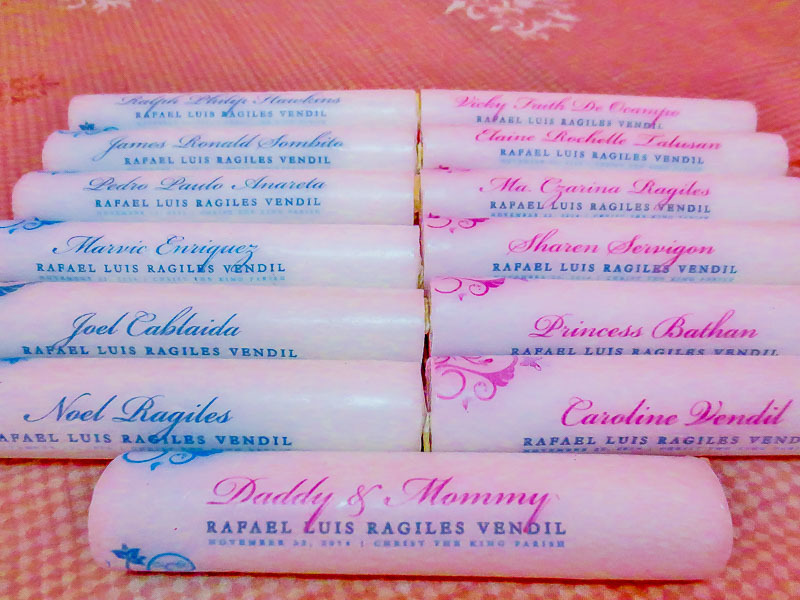 Indeed, it can make you feel like a VIP, and that's exactly how I wanted Rafael's godparents to feel. They were chosen to be my son's second parents; to lead by example and to guide him as he grows up so they're really special. Honestly, in the beginning, I was hesitant to make a transaction with online merchants like Clay Land. You cannot blame me for having second thoughts because of all the online scam and bogus businesses wandering all over the world wide web. But their ref magnets were just so cute and simply irresistible, so I decided to try. I told myself, I would order just a few pieces for Rafael's godparents. If they would be able to deliver, then well and good. But if in case they won't, then that would be a learning experience for me. So, I sent them a message to ask about the price and the process of placing an order. In fairness to them, they had responded to my inquiry right away. The price of the ref magnets actually vary depending on the style and the quantity of your order. I will not be disclosing the price here but be rest assured that they were priced reasonably. I paid the whole amount through bank deposit so that they could confirm my order. Just a piece of advice, if you are interested in doing business with them, make sure that you place your order ahead of time (at least 2 months prior to your requested delivery date) because they really have tons of orders. 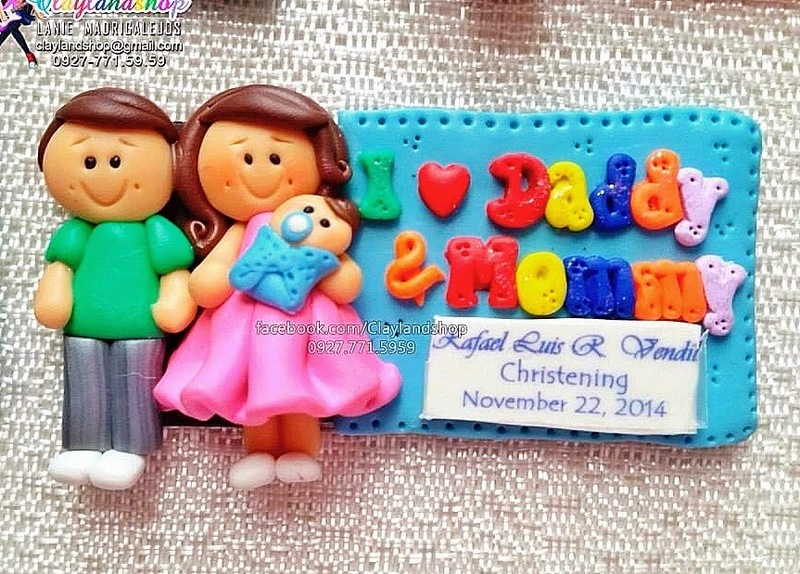 I ordered my souvenir four months before Rafael's Christening and had it delivered a month before the event (so I still have enough time to look for another supplier of souvenirs in case they happen to be a bogus one). Gladly, they weren't. They were able to send my package on the day of my requested delivery date and the souvenirs were just perfect! I am one happy customer of Clay Land Souvenir Shop! 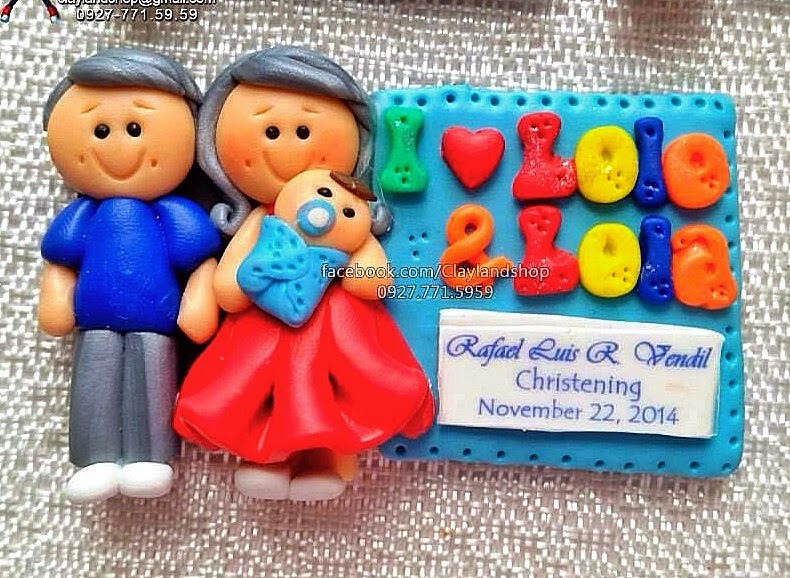 Aside from the ref magnets that I ordered online, we also had Rafael's Christening candles personalized. However, in this case, the candles were not ordered from an online shop but instead, a DIY project of my younger brother. Being the production manager that he was of our humble family-owned printing press, he was able to transform an ordinary candle into a unique and classy personalized candle which also served as an added souvenir for the godparents. Congratulations for a job well done, Hijo! The clay magnets are really cute!! What I had are card ref magnets instead of clay. Also the candles are very nice, I scouted for the same, but changed my mind because of the additional cost, instead I bought and ordinary esperma and tied a ribbons on it. It was yesterday pala! 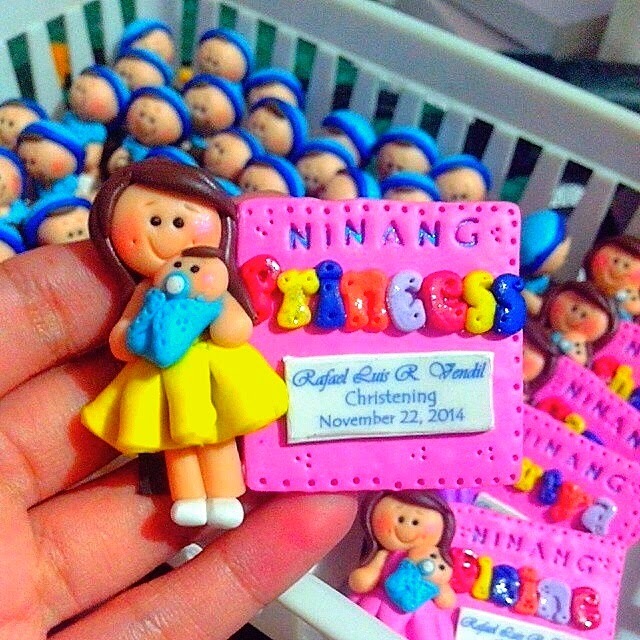 Happy Christening Rafael! Welcome to the Christian World! Thank you, JanzCrystalz January. The candles were made by my brother so basically we didn't spend anything on them. Hello, how much is the magnet? Hi Jeane! I paid Php 2,060 for the ref magnets (including packaging and shipping fee). 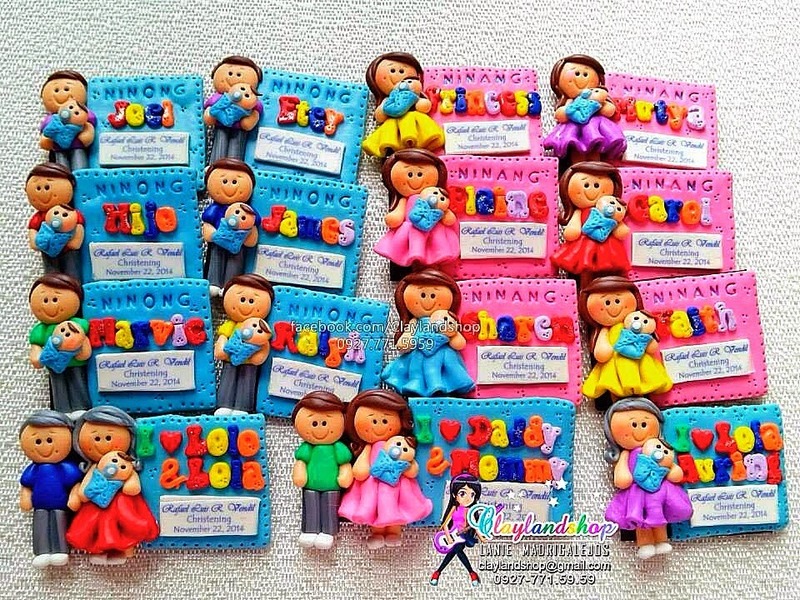 The souvenir for ninongs/ninangs cost Php 100 each while the souvenir for the grandparents cost Php 180. That was the rate they gave me last year.